Becoming an independent researcher can be a bit overwhelming: independence is great, but having so much time to dedicate to your project can also be challenging. This is one of the most shocking things when you swap from your taught programme to a purely research one. It took me a while to figure out what my role as a PGR was! And I’m still learning. At the very beginning of my first year I felt a little lost and although I had already met my supervisors several times, I still wasn’t grasping what it really meant to be a ‘researcher’. After this year, I have learned that research is a process and isn’t only limited to writing a thesis, but includes engaging in several activities that will ultimately contribute to the final thesis. What is the question I want to address? What is the general goal of my research? What am I going to say, and how? What is my main hypothesis, and which arguments can I give to best support it? Why is my research important? Has anyone said anything similar before? Who has said what? How can all these things be connected? Check out these previous post to learn more tips about how to undertake a good literature review and what to avoid. At the same time, you will also be working on how to organise this research process and how to present your results. This is what is known as the project proposal– that plan that you sent when you applied for your research program. You’ll find out that this proposal will change a lot during your period as a researcher because this will be affected by your research question, your findings and others’ findings. The key thing is to remember that this isn’t a problem! Researchers need to be very flexible and ready to change the outline of their research, until the one that works best is found. This is one of the most daunting parts. Although we have lots to say, our brain can freeze when we sit down to write. Don’t panic! Writer’s block is a common thing. Some quick tips are: write a bit everyday (taking notes and summarising also counts), share your drafts with others and practice some freestyle writing (maybe some Blogging can help here!). Improving your research skills is important to be successful in the previous area. While some of these skills can be acquired by attending specific training, others benefit from constant practice and interaction with your peers and supervisors. Here, are some of the practices I’ve found the most useful for improving my research skills. There are countless workshops that you can attend (and for free!). For this, it’s always good to consider your specific needs by examining your weaknesses and your research requirements. In my case, I found that I needed to work harder on my academic writing and for this, I found the sessions run by LEADS to be extremely useful. Attending conferences, especially as a speaker, has a huge positive impact on your research skills. During the conference, you have the chance to put into practice all the different necessary skills for a good researcher such as presentational and interpersonal skills. Conferences give you the opportunity to present your work to a wider expert audience that will provide you with direct feedback about your research. During your life as a PGR you will get tired of hearing the word ‘networking’, which, in the end, simply boils down to your interaction with other researchers. This is a vital part of your research and it can have a big impact if used effectively. Sometimes, it will only consist in talking with other researchers about your work, but on other occasions, this can also pave the way to exciting collaborations! Last but not least, there’s the important area of wellbeing which, given the amount of research work, we naturally tend to neglect. It can seem that this isn’t related to our research, but it is an essential part. There are so many things that can impact on work productivity, including lack of sleep or stress about personal issues. 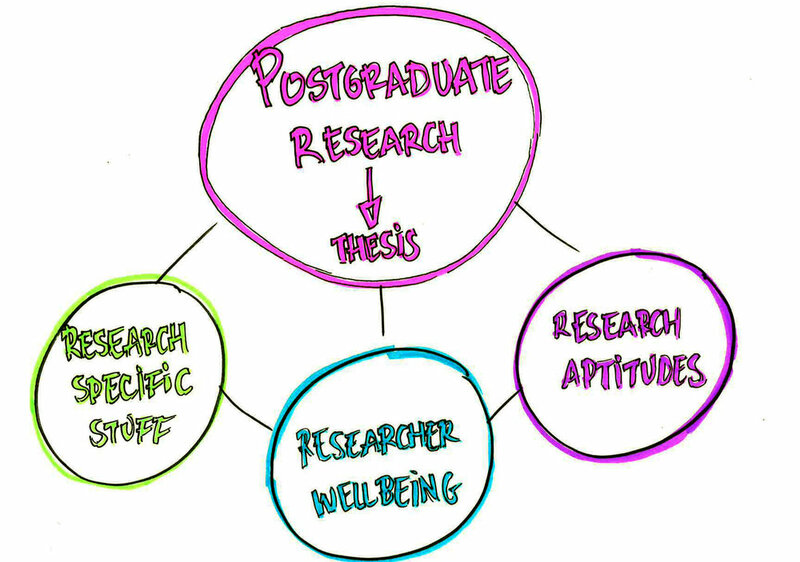 It’s very important to work on these matters, during and after your research day, and avoid prioritising research over personal wellbeing. Regardless of whether it’s taking part in sports, taking a bath,going to the pub with your friends or checking out the clubs and societies at the University, it’s vital that you make some time for yourself. Also, inspiration is important for your work. You won’t always experience those ‘Aha!’ moments while reading a paper –sometimes they pop up while you are cooking or having a beer! While this post isn’t intended to be some sort of list of ‘must-do’s as a researcher’, it will hopefully help you to realise that ‘research’ isn’t just about reading and writing articles, but that it’s a large process that involves many factors. Working on these factors evenly should help you to make the most of your experience as a PGR here!